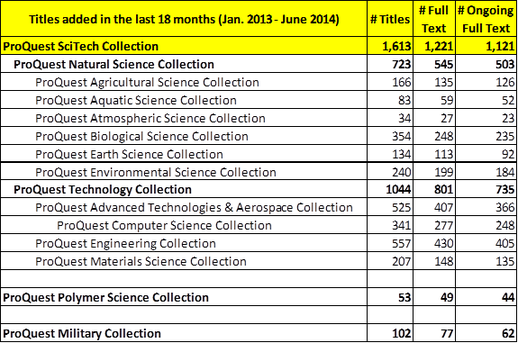 In the past 18 months, since the start of 2013, 1,613 total titles (see breakdown in chart) have been added to the ProQuest SciTech Collections. To read this data in infographic form, click here. In addition, 53 titles were added to the ProQuest Polymer Science Collection, and 102 titles to the ProQuest Military Collection. Both of these collections currently sit outside of the ProQuest SciTech Collection hierarchy. Some titles are included in more than one collection. The additional 1,221 full text titles represent 317 different publishers, and the majority is scholarly journals. The full text titles are published in 52 countries, with 312 titles from the United States, 240 titles from India, 115 titles from Poland, 102 titles from Switzerland, 94 titles from the United Kingdom, 41 titles from Pakistan, 32 titles from Canada, 32 titles from Romania, 26 titles from Singapore, 22 titles from France, 15 titles from Brazil, 6 titles from China, and many others. High-impact factor titles added in the past 18 months include Immunity (Elsevier), Neuron (Elsevier), Trends in Immunology (Elsevier), PLoS Biology (Public Library of Science), Journal of Allergy and Clinical Immunology (Elsevier), Trends in Biotechnology (Elsevier), PLoS Genetics (Public Library of Science), PLoS Pathogens (Elsevier), NeuroImage (Elsevier), and Cancer Letters (Elsevier). 70 full-text trade journals were added, from such publishers as Cygnus Business Media, Advantage Business Media, Hart Energy, SGC Horizon Building & Construction Group, and many others. 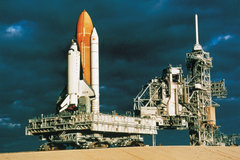 78 full-text magazines were added, from such publishers as Athena Information Solutions, Dennis Publishing, Haymarket Business Publications, Gardner Business Media, and many others. In addition to serials, 47 full text conference proceedings were added, from such publishers as The Steering Committee of The World Congress in Computer Science, Computer Engineering and Applied Computing (WorldComp), Vilnius Gediminas Technical University, Research Publishing Services, IACSIT Press, The Institution of Engineering & Technology, Surveying Geology & mining Ecology Management (SGEM), "Carol I" National Defence University, and others. • 216 videos from the INTELECOM Environmental Studies Video Collection were added to the ProQuest SciTech Collection, ProQuest Natural Science Collection, and ProQuest Environmental Science Collection. • 183 videos from the INTELECOM Oceanography Video Collection were added to the ProQuest SciTech Collection, ProQuest Natural Science Collection, ProQuest Aquatic Science Collection, ProQuest Atmospheric Science Collection, and ProQuest Earth Science Collection. Download all of this information via our infographic. See what’s available title by title, in the updated Title List. 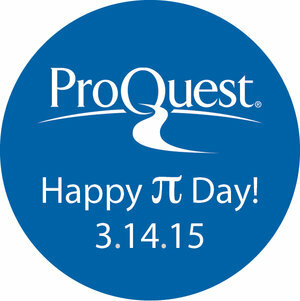 Contact a salesperson about purchasing or renewing a ProQuest SciTech database.